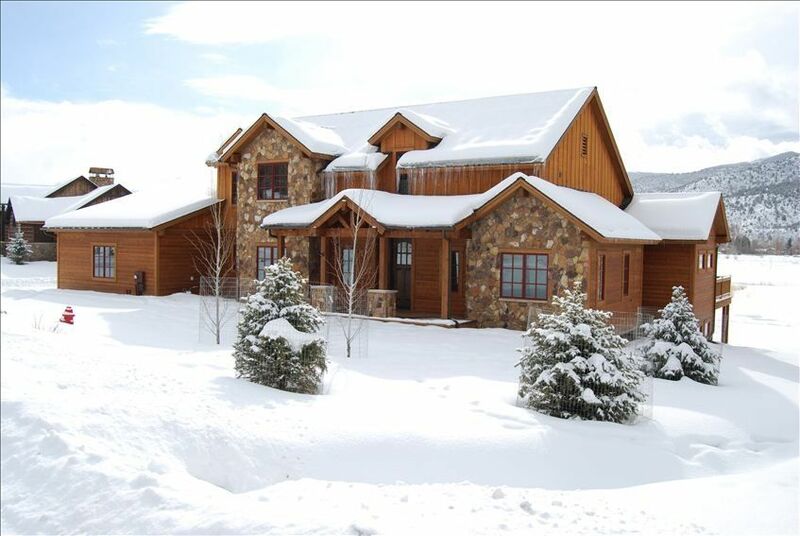 Stunning Brand New 6 Bedroom Home available for Vacation rental in the Aspen Valley area in Colorado, easy 30 minute drive to Aspen and Snowmass resorts. World Class Skiing, Winter Sports, Dining, and Shopping. Great place for entertaining; the home is filled with many upgrades including Movie Room, Master Suite with floor to ceiling European Marble Shower, Pool table, Imported Italian Travertine Stone throughout other baths, 6 Bedrooms, Gorgeous Hardwood Floors, Wireless Internet Access. Luxury in the Rocky Mountains !!! Can easily accommodate 2 families. A small group of friends stayed here Feb 2019. It is a decent property, but it's located in the middle of nowhere and had quite a few issues. The main issue was the location because it's just too far from modern conveniences and there is a herd of deer that live on/near the property that prevented us from hanging out too late b/c one night we couldn't get home until they cleared the main road (~ 20 minutes) and on another night, a deer ran in front of our car and we had to swerve to miss it. Another problem with the location is that the roads didn't get plowed expeditiously so my group left a day early to avoid getting snowed in before a severe weather alert (2/18/19). I contacted the owner about this issue, but they never responded. Regarding the house, it has good bones, but it lacks TLC. For instance, the property lacked an information binder, so we had to figure out everything by trial and error (operating fire place, surround sound, etc.). However, some issues weren't fixable by us, like, the steam shower inside of the master bathroom didn't even turn on. Also, the dishwasher has some caked-up residue/deterioration/germs at the bottom of it, so we deemed it unsafe to use, after failing to clean it with one empty wash cycle. Lastly, one day we came home to the patio doors completely wide open and the house freezing. This really spooked the group until we realized the patios doors have some overly complicated handle system to secure them-- it took several adults (including 1 engineer and 3 lawyers) a full day to figure out how to secure the patio door and while we did so, we put a chair in front of the door to keep it closed. Another issue for us was the excessively loud washer and dryer. The washroom and master bedroom don't share a wall with any of the bedrooms, but the machines are so loud that they caused a strife in the house because someone washed their clothes at 5 a.m. and woke up the people in the master bedroom because the machined shaked, rattled, and hummed so loudly. Given my concerns about safety and maintenance, my opinion is that this house is just too much hassle to enjoy the winter Aspen nightlife, given the 30 to 45-minute drive to Aspen or Glenwood Springs and early time of sunset. To make this home more enjoyable for winter stays, it would be nice if the home had outdoor fireplaces or saunas. We are very sorry and somewhat shocked to read the response to your stay at our 5-STAR HOUSE. Regarding the comment about 'no information binder' - An email was sent to you with the address of our house along with a "WELCOME PACKAGE" attachment and acknowledged by you on the week of your stay ( I have a saved email along with telling you that it was no problem for you to have an EARLY check-in for your convenience). Our PHONE NUMBERS are on the VRBO website along with a VRBO clear map location ( we NEVER received a call from you during your stay at our house because we would have answered any questions and explained anything you needed). The VRBO description of the house clearly says that we are a 30 min drive from the Aspen area. We have had some of our guests return each year for the past 10 years. Many other guests who absolutely love our house, all of the amenities, and location with activities and have made multiple return trips! In response to 'the middle of nowhere' comment, the house is in a Spectacular Ranch allowing for beautiful mountain and lake views with wildlife visiting occasionally and all of our guests get very excited when getting to view our incredible Colorado wildlife! We are a 2 minute drive to the Whole Foods shopping center, in Basalt, where shops and approximately 10 amazing restaurants are located along with an additional 'City Market' in the same location. All of the things that you 'couldn't figure out' are addressed in the "WELCOME PACKAGE" sent by EMAIL to you in addition to a "Welcome to our Home" Paper BINDER located in the Great Room of the house to make your stay comfortable (along with how to properly close the dining room doors, not complicated at all). If you HAD contacted us by phone, we could have happily answered any questions, but we didn't receive any calls. Specifically, the dishwasher is newer and is one of the quietist units we have ever heard. The only thing we can actually acknowledge to be true is that the dryer does make a noise and we are replacing it. Our development's HOA is excellent at snow removal, and we've also never had a complaint about snow removal. Everything that is advertised on the VRBO website was available to you (and more), and we are sorry that it sounds like you would have rather stayed in Aspen itself ( at a MUCH higher price for a 6 bedroom house with all of our amenities). The house is fantastic. Plenty of space to spread out with a larger group. We had a relaxing visit at this property. Our friends and family were blown away. The location to the surrounding areas is perfect to explore different parts of Colorado. One morning we even woke up to deer outside the front door! We’ll definitely be using this house again in the future. To add to all of that, the owner of the property was very easy to work with. They have towels, linens, dishes to use, and the pool and ping pong table are nice add-ons. If it’s available, take it. You won’t be disappointed. Cheers! This house is large and in a bucolic setting, but is also a short drive from Aspen and Glenwood Springs. We had a great time and everything went smoothly. We had a wonderful time and enjoyed the beautiful house. Everything was fantastic! It is a beautiful home in a lovely area. We were in Carbondale for a family wedding and this lovely home provided a fantastic venue for our family. The owner is very gracious and welcoming. I would highly recommend this gorgeous home. Thank you for the opportunity to submit a recommendation. Everything was Great! Nice big backyard for the kids to play baseball and other games. Nice big rooms, did not feel crowded , as there were 10 of us in the house. Really quiet area. Just a short drive from all the things we had planned to do . You will enjoy this home and area. Beautiful home close to many activities! Gorgeous home in a serene neighborhood!! We had plenty of room for multiple families and loved the big grassy yard for the kids. We really enjoyed the pool table in the basement. Glenwood Springs is amazing and so many fun activities to do. This was one of our top vacations ever! !